A Sunday roast is de riguer to the English and we have taken that on in our home. It gives us something to look forward to at the end of the week. 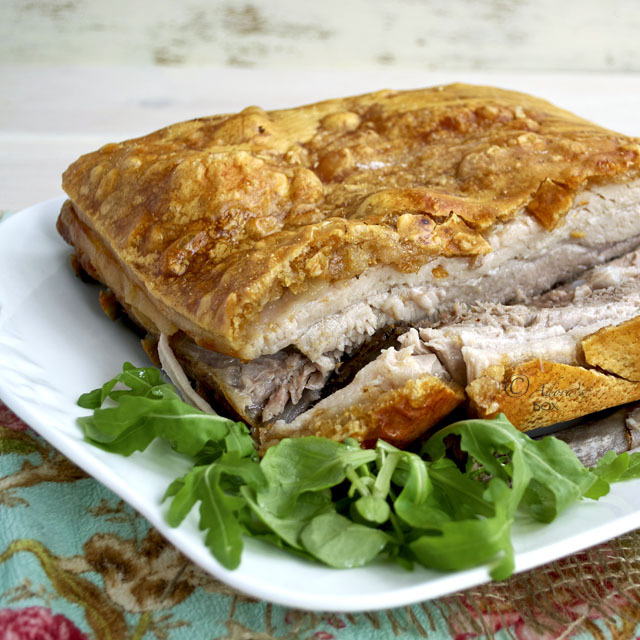 Our roast is not always English style. Asian roasts also grace our table and gives the same amount of pleasure. 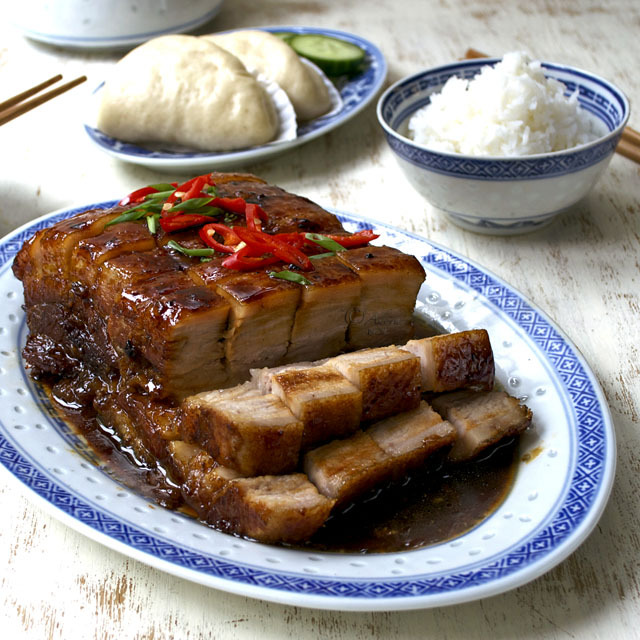 When I saw Gok Wan cook this pork dish on TV, I was in awe. Its looks definitely wows yet the cooking process was quite easy. The name called me: twice cooked melting pork. Melting is the key word here. We all know how delicious belly pork is when cooked to the melting stage, especially when aromatics are added such as in this case. After the initial cooking process has infused it with so much flavour, it is briefly roasted with a soy and honey glaze to seal the deal. The fat melts and bastes the meat, coaxing it into succulence. 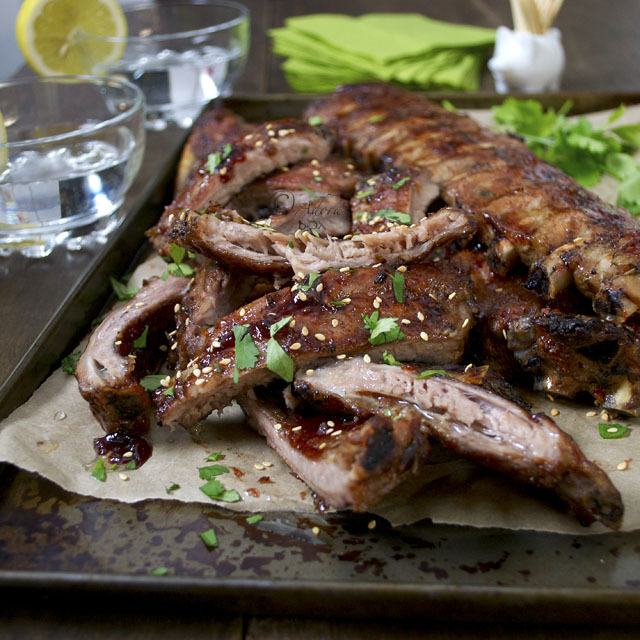 The glaze caramelises and coats each morsel with another level of flavour. Each mouthful is punctuated with the spring onion and chilli topping. Awesome! This dish is very easy to make. It can be pre-cooked and refrigerated a few days before roasting. I used a pressure cooker to shorten the cooking time to half an hour. If you are entertaining, this dish will wow your guests without them guessing that you didn't break into a sweat preparing it. 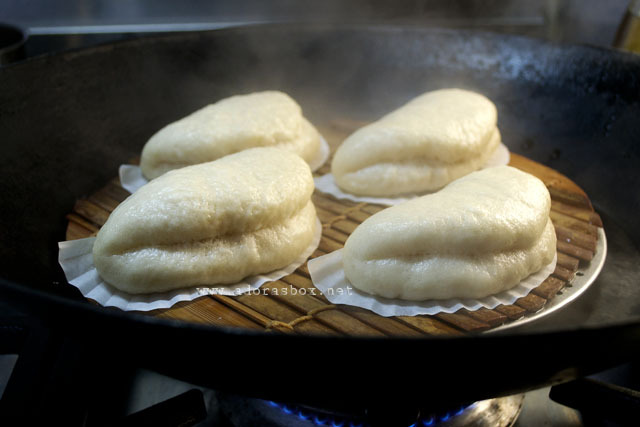 Simple side dishes such as stir fried vegetables, steamed rice or steamed buns (I made my own using this siopao dough recipe) is all you need to complete the meal. I did not want to waste any delicious bit of this meal. 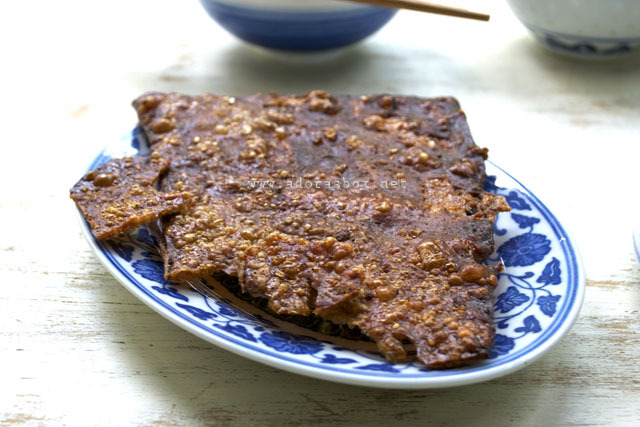 Although Gok Wan says the pork skin has to be discarded, I saved and roasted it alongside the meat to make it into crackling (and that is why he is so slim and I'm not, but never mind). I also saved the cooking liquid as that has taken so much flavour from the pork and the seasonings. 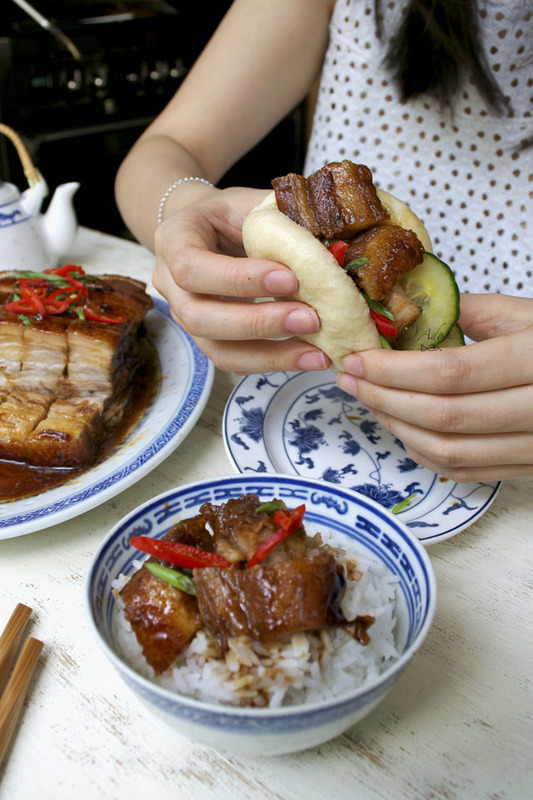 It can be used as extra sauce for spooning on rice or for dunking the steamed buns in. All in all, I found this dish easy to cook, so delicious and as a bonus, inexpensive. 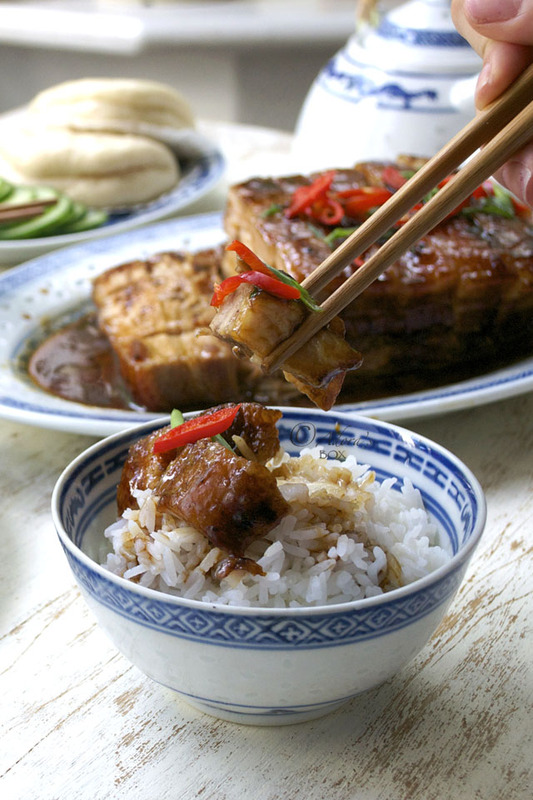 Recipe adapted from Gok Wan's twice cooked melting pork recipe. 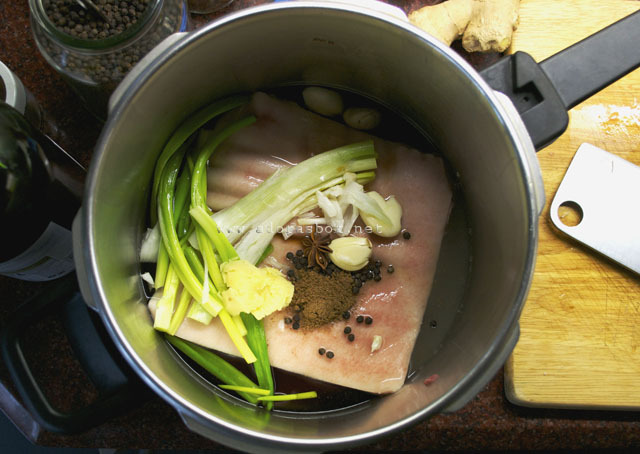 Put the joint of pork belly in a pot that's large enough to accommodate it. Add the rest of the ingredients and top up with enough water to reach the top surface of the pork. Bring to a boil and cook, covered, until tender (about 2 hours). I used a pressure cooker for 30 minutes. 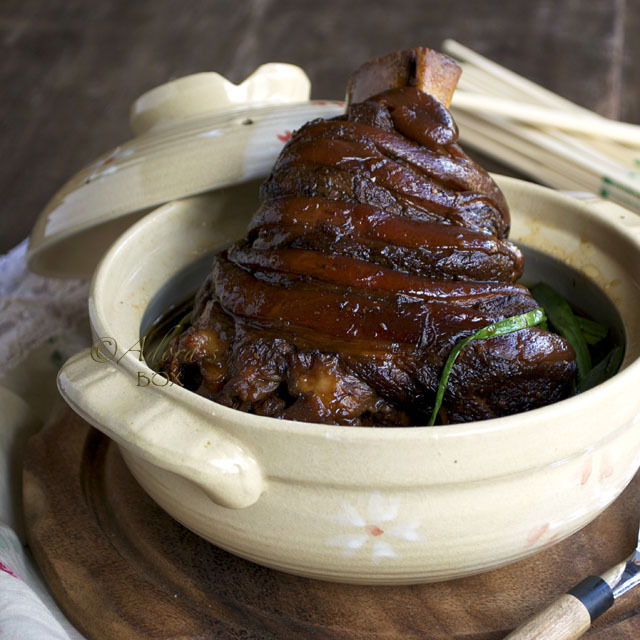 Take the pork joint out of the pot and let it sit on a rack to rest. Reserve the sauce. 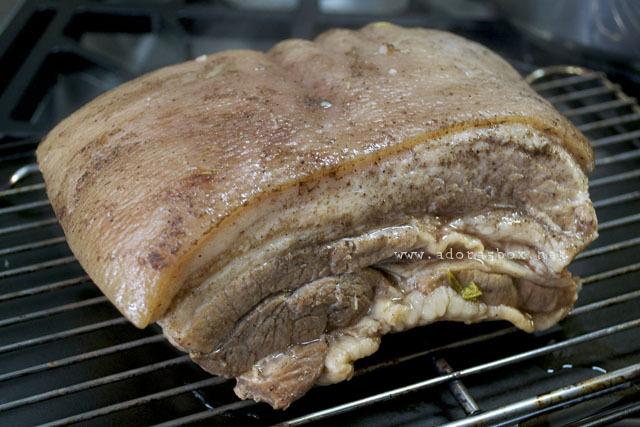 Pre-heat the oven to 200° C/400° F.
When the pork has rested and is cool enough to handle, peel the skin off. green parts of a spring onion, sliced. Set the pork belly on an oven tray. 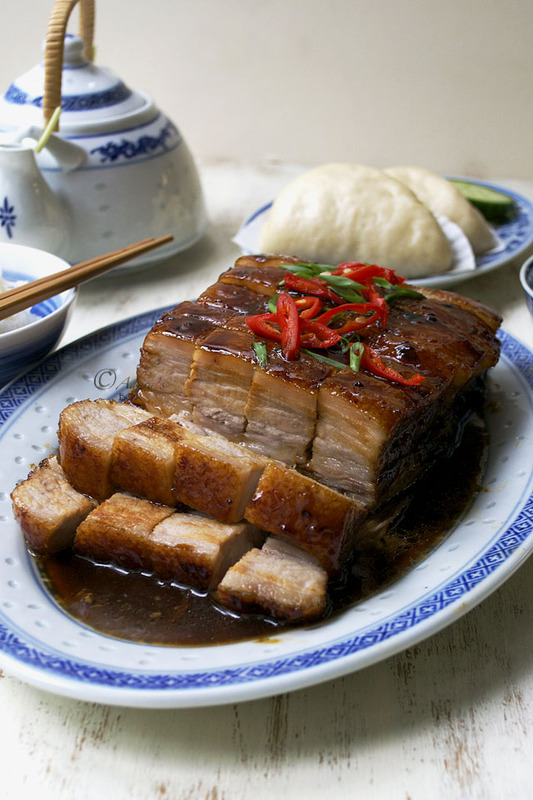 Mix the honey and light soy sauce together, pour on the pork belly and baste all over. 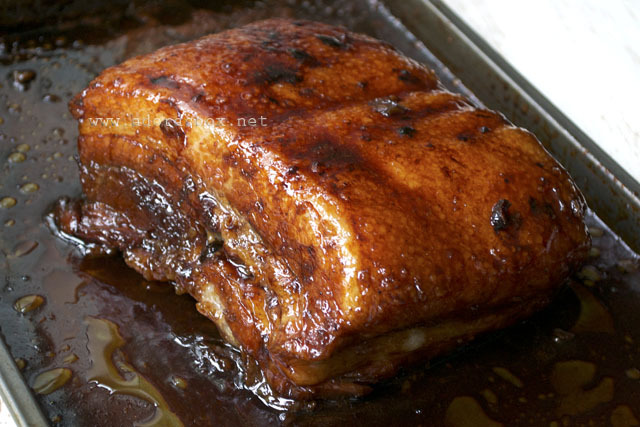 Roast for 25-30 minutes until the pork is glossy and caramelised. The glaze will run off the pork so baste it often. 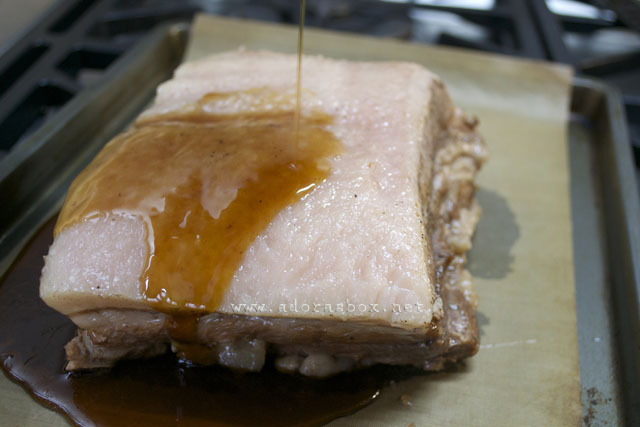 As it roasts, the glaze will thicken and stick to the pork belly. If the glaze on the baking tray thickens too much, add a spoonful at a time of the cooking liquid to dilute it so it doesn't burn. 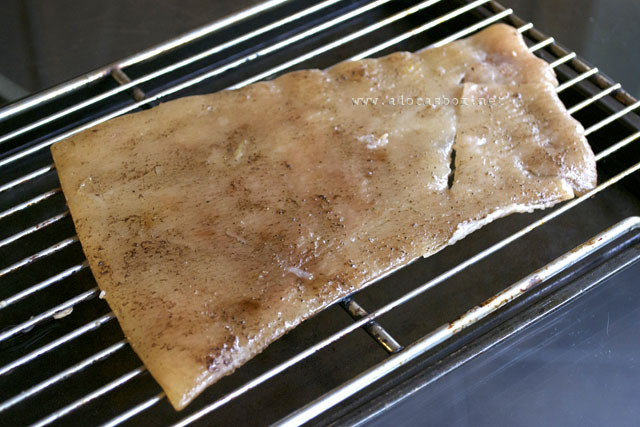 If you want to make crackling out of the pork skin, lay it flat on a rack on an oven tray. Poke holes all over the surface using a fork. Brush with cooking oil. 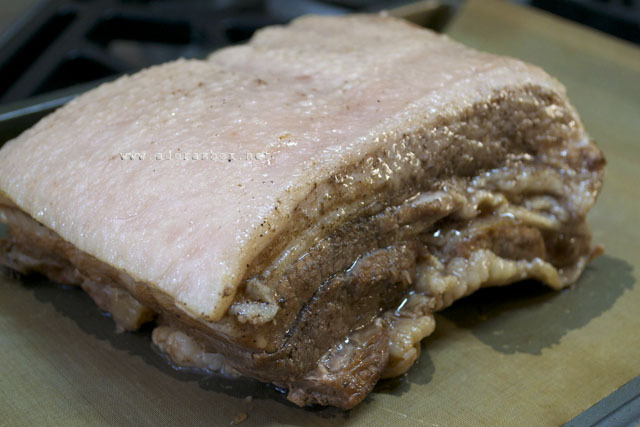 Roast on the upper oven shelf, as the pork belly roasts, until crisp. When done, take the joint out of the oven and transfer to a plate to rest for about 10 minutes. Cut the into bite sized pieces. Transfer to a serving dish and sprinkle the chilli and spring onion slices on top. You can use the cooking liquid as a sauce. Strain and add honey to taste. Serve with the pork. Follow this recipe for the siopao dough. After proving the the dough, divide into 24 pieces and roll into balls. 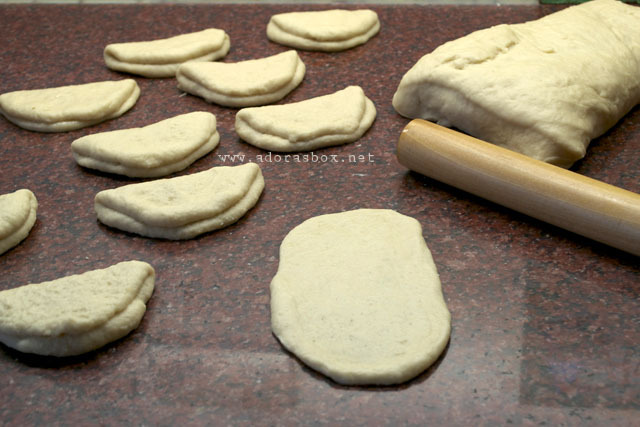 Roll the pieces of dough into oval shapes and fold each in half. Set on halved paper cases or semi circular pieces of paper. Steam for 10-15 minutes until puffed up and cooked. 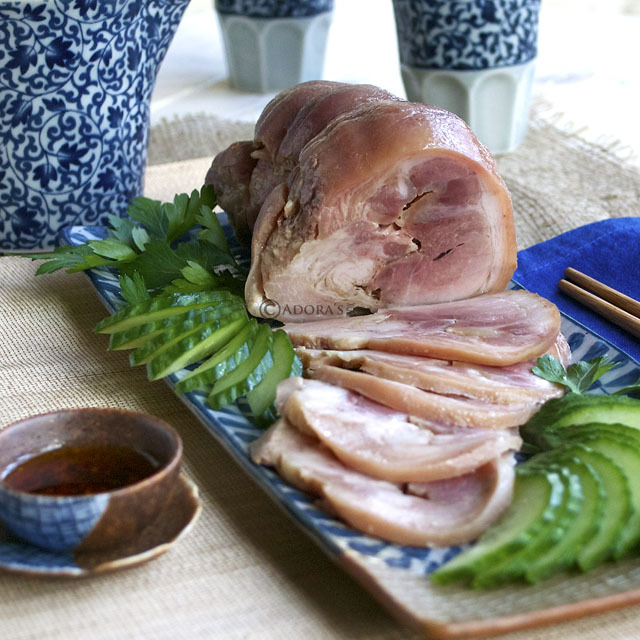 I saw this delicious pork at your fb page and already knew this is definitely my kind of dis as I love this word " twicw cooked pork". And here I am....looking at all these pic just made me speechless and you even made your own pao. Adora, you should enter the Masterchef UK!! You can do it! Let me be your No. 1 fan, ok? I've never cooked pork belly before and really have never had the inspiration to do so ... until now. WOW! This really looks good! I can see making a pork belly taco with this, although it sure looks good over rice.